To be completely frank, when picking locations to invest in, Propertyology places ZERO weighting on population projections. As for historical population growth, while it is of interest to us, it is a long way down our list of priorities and here’s why. 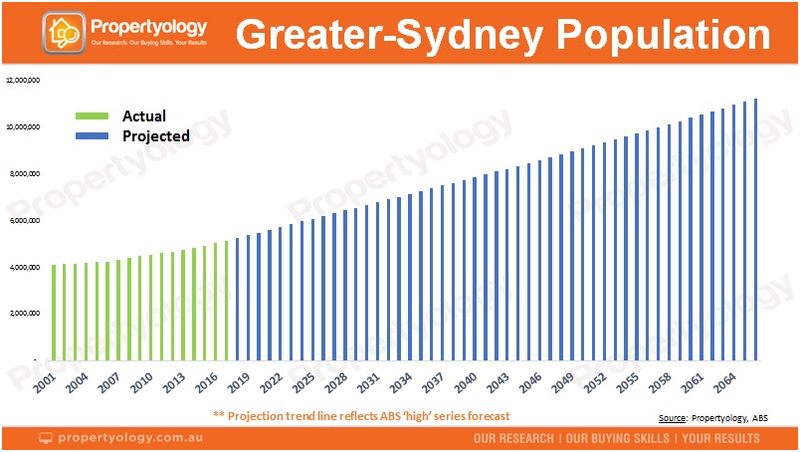 The ABS recently released population projections for the next 50 years. The projections were published for every state, Australia’s eight capital cities, and the ‘rest of the state’. Aside from cries of ‘where will they all fit?’, population projections often create heightened interest from avid property investors who feel these numbers provide valuable insights in to the best property markets of tomorrow. If the projections are correct, Sydney’s population will be as big as London’s is today (8.8 million) in 30 years’ time, Brisbane will be as big as Singapore (5.6 million) by 2064, and Australia’s total population will double over the next 50 years. Melbourne will overtake Sydney and become Australia’s biggest city during the year 2031. In Sydney’s case, over the next 20 years, the population is projected to increase from the 2017 figure of a bit over 5.1 million to 7,498,729 – don’t forget the ‘9’. Population projections are made by adjusting historical rates of growth for anticipated changes in the rate of births, deaths, and migration. A future annual rate of growth is adopted and then extrapolating across the next 50 years. That’s why the trajectory is very much a smooth line. But evolution is never smooth. There’s no great science to it, nor does there need to be. The primary purpose of population projections is to calculate a back-of-the-beer-coaster figure for the likes of governing bodies, economists, town planners and big business to plan long-term growth. If the projections are correct, Canberra will pass 500,000 in 2026, Brisbane will push through the 3 million barrier a year later, PerthPerth, TAS Perth, WA will be home to 2.5 million people by 2030, 300,000 people will be living in Hobart by 2037, and there’ll be as many people living in regional Queensland by 2066 as there are living in Melbourne today. Population projections are fine and dandy, but what’s it got to do with property prices? Well, of course they’ll be more expensive, but not in a way that you might think. 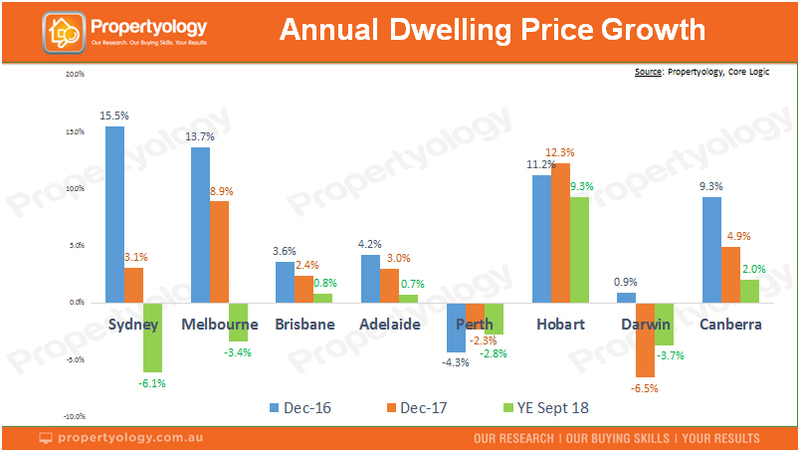 For kicks and giggles, Propertyology has prepared a back-of-the-beer-coaster projection for capital city median house prices. We’ve simply taken the average annual rate of price growth from the last 30 years and extrapolated it over the next 30 years. Completely contrary to what the vast majority of people believe, property prices are NOT all about population growth. Yes, you heard that right! 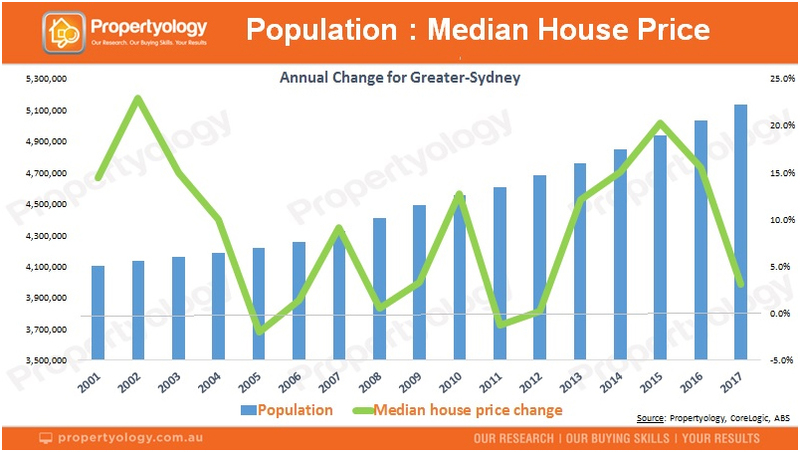 If they were, how does one explain the rollercoaster annual changes in Sydney’s median house price (and every location in Australia) from one year to the next, even though the annual population changes are relatively smooth? Why is it that, in 2018, the year directly after all-time annual population growth records were broken in Sydney (101,745 people) and Melbourne (123,362 people), the value of a typical house declined (yes, declined) by $80,000 and $40,000 respectively? 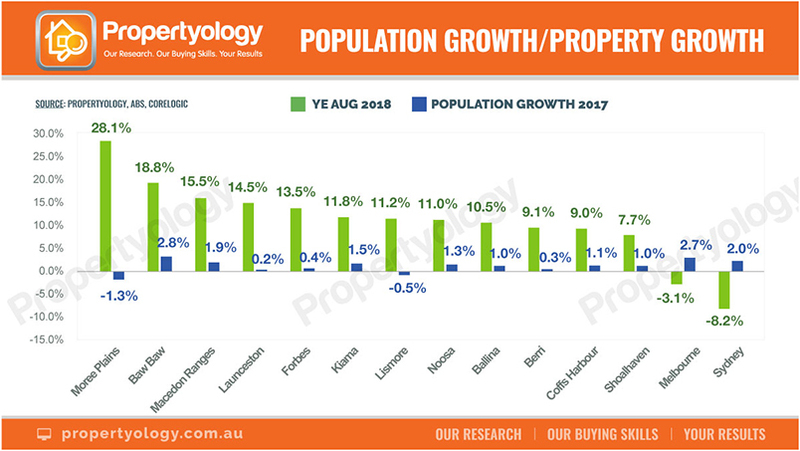 In fact, Australia’s best-performed property market over the 12 months ending August 2018 actually lost population last year. The northern New South Wales regional town of Moree Plains saw property prices rocket by an incredible 28.1 per cent yet their population declined by 182 to 13,408 people. And if you think that’s a one-off aberration you best think again. With a population of 67,000 people, Launceston (Australia’s 34th largest city) is currently one of the hottest property markets in the country but its population increase of 0.2 per cent last year is well below the national average of 1.6 per cent. LismoreLismore, NSW Lismore, VIC’s median house price increased by 11.2 per cent and its population declined by 0.5 per cent. Forbes in New South Wales (13.5 per cent price growth) and Berri in South Australia (9.1 per cent) also have incredibly strong property markets in spite of mild population growth rates. Australia’s best-performed capital city property market across the last three calendar years – Hobart - does not have the highest population growth rate – far from it. Arguably the most consistent property market in all of Australia over the last 20 years produced population growth each year but it certainly didn’t set any national records. 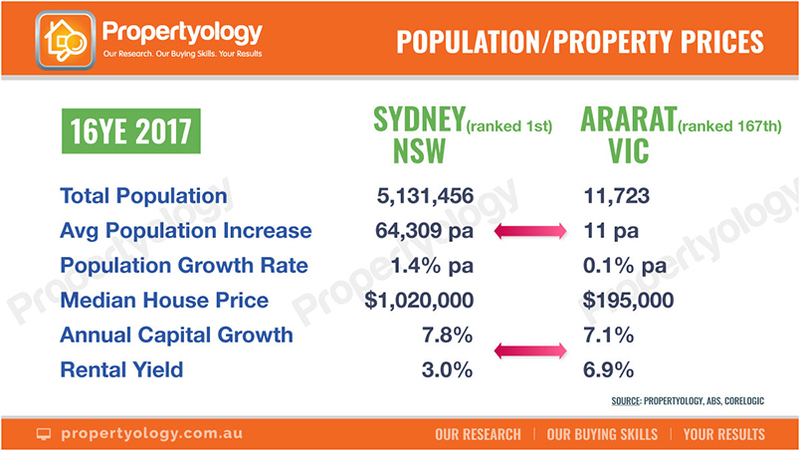 One of the most fascinating case studies from the Great Southern Land’s property market history is the comparison of Sydney (Australia’s biggest city)to the regional Victorian township of Ararat (Australia’s 167th largest – population 11,723). Over the sixteen years ending 2017, Sydney’s population increased by an average of 1.4 per cent per year (or 64,309 people) while Ararat’s only increased by 11 people per year (the grand sum of 3 households). The median house price over that same 16-year period increased by 7.8 per cent in Sydney and only mildly less in Ararat (7.1 per cent). When rental yield is added so that we have a ‘total return’, the return on investment was superior in Ararat where one could buy five houses for the cost of one in Sydney. Now can you see that it’s not all about population growth? For property investors, population growth data is a lagging indicator. It’s a biproduct of factors such as swings in employment opportunities, affordability, varying lifestyle choices, and immigration policy. The significant delay in the annual publication of population changes in each Australian city(capital and regional) also brings in to question the usefulness of this information. Decisions relating to investing are more about the future and very little about the past! 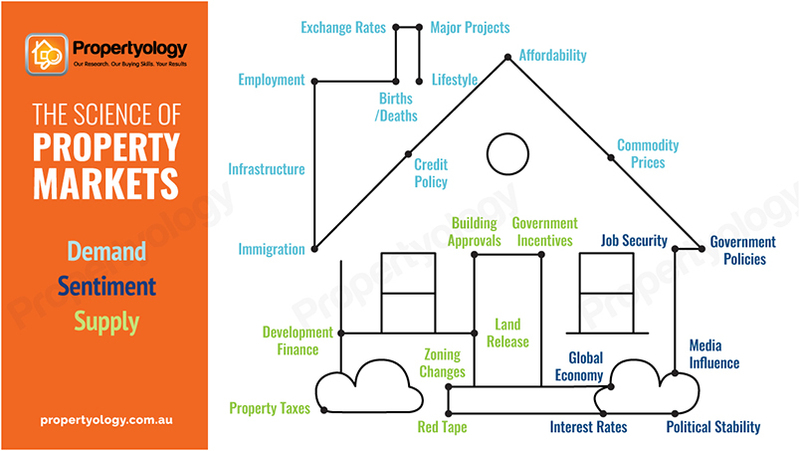 Of course, population growth does play a role in property prices, but it is just ONE factor. Those who obsess about population data being the investor’s panacea risk setting themselves up for disappointment. It’s far from the most important factor which influences rises and falls in property prices. Similarly, it’s nowhere near as simple as subtracting the volume of new dwellings built (supply) from population growth. DEMAND is made up of multiple factors. SUPPLY also has several key influences. And one should not underestimate the influence of SENTIMENT. There are many, many dots to join when one tries to forecast future property price changes. 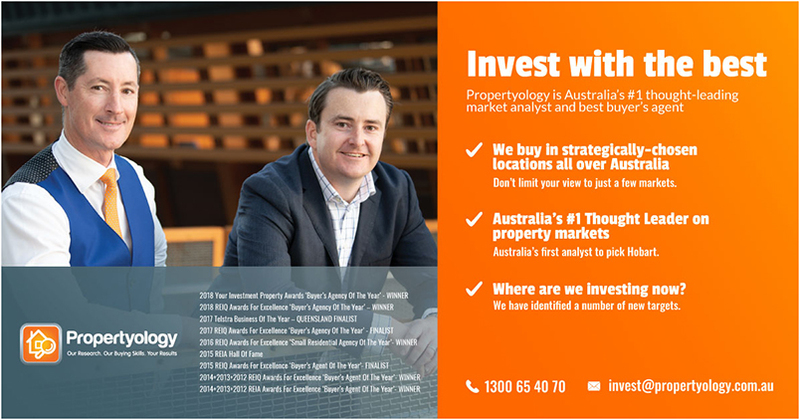 Propertyology is a Brisbane-based buyers agency and (national) property market research firm. Our multiple-award-winning business is currently helping everyday people to invest six locations across four different states. Like to know more? Contact us here.